When a plant is used across cultures and geographical boundaries as ethnomedicine and food, it indicates that the people found the properties of the plant after generations of trial and error with their own local produce, seasons and natural instincts. Semal, also called kapuk or silk cotton tree (Bombax ceiba), that flowers spectacularly in spring and becomes a bird magnet, is one such tree. Many tribal communities consume semal because of its medicinal properties. Others worship and protect the tree. A clan of the Bhil tribe in Rajasthan, for instance, protects the tree because they consider it a tree totem. The Khuman clan of the Meetie community in Manipur also protects and conserves the tree and uses the tree produce. Many folk songs are dedicated to the semal tree in the tribal regions across India. Long ago, when we moved to the erstwhile Central Institute of Fuel Research in Dhanbad, Jharkhand we inherited a huge semal tree. We used to make soft pillows using the silk cotton from the tree. To my surprise, many local tribal women used to come and collect the fallen fl ower buds. They told me hesitantly that they make sabzi, a vegetable dish, with it. It triggered my quest to know more about semal. I learnt that the silk cotton and even the tough thorns on the bark are used to treat migraine. 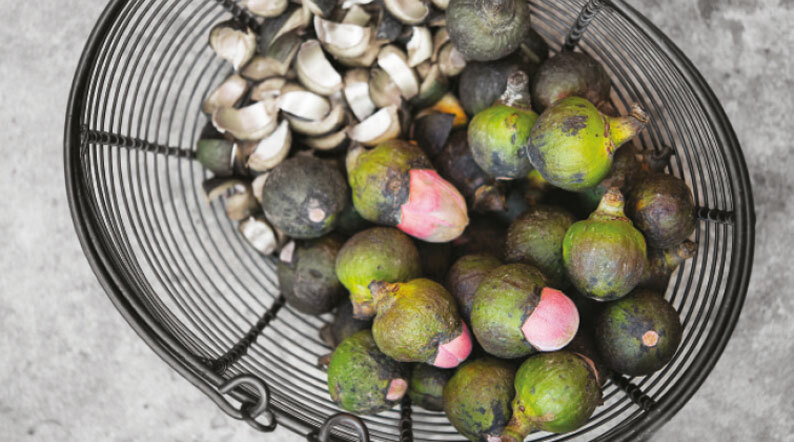 Various parts of semal tree are used to treat gastrointestinal, skin, gynaecological and urogenital diseases. Many studies have proved the plant to have antimicrobial, anti-infl ammatory, antioxidant, analgesic and oxytocic properties. The roots, stem bark and seeds have the ability to prevent liver damage. Alcoholic extract of the bark and thorns are used to treat acne. Being an antioxidant, semal helps reduce blood pressure and is also good for the heart. When grown as natural bunds, this tree attracts several pollinators and provides fodder for farm animals, apart from meeting the occasional fi rewood demand. Semal is a fi re-resistant tree. It is also known for its cooling properties, and if one plants semal trees around housing colonies, the environmental cost of air conditioning can be minimised. The tree binds the soil and provides huge amounts of fallen foliage and fl owers that are an excellent medium for vermicomposting. It is considered a pioneer tree that generates a rich biomass every season, and has been used to reclaim wastelands. Its leaves and fl owers are large and leathery. This ecologically active tree fi xes carbon and helps carbon sequestration by shedding all leaves before fl owering. Many researchers believe the semal to be a bio indicator—a late fl owering could mean a hot summer or a delayed monsoon. Semal has a culinary utility and commercial value too. While walking around the markets of Moradabad, a cart loaded with semal buds caught my attention. I asked the lady on the cart how she cooks it. I asked her if the buds would survive four days in the car trunk, and she said we could peel and chop them, and also sun-dry them to preserve. Once home, I made a sabzi—one with fresh semal and another with the sun dried ones. The sabzi made with fresh buds is a little slippery in texture, almost like steamed okra. It has a faint fragrance. Sun-dried semal need to be rehydrated and they taste a little more intense. But here’s the sweet irony: some rural communities believe semal is inauspicious. This myth may have originated because the spiny outgrowths on the stem bark have some pathogenic bacteria, which act as a biological defence, protecting the tree from animals and injuries. Separate the fleshy green sepals from the red petals forming inside. Chop the sepals (the green covering of the bud) into four parts lengthwise. Heat two tbsp mustard oil and add the chopped semal sepals. Fry for three-four minutes. Add the cubed potatoes and fry for five minutes more. Keep aside. Heat the remaining 1 tbsp mustard oil and tip in the methi seeds. Wait till they turn light brown and then pour the onion paste. Fry the paste till it becomes pinkish brown. Add the ginger-garlic and tomato paste and salt. Cook till the mixture gets glossy. Add the powdered spices and mix well. Stir and cook for a couple of minutes. Add the partly fried semal sepals and potatoes to the cooked spice mixture. Add water, mix well and cover the lid. Cook for about 15 minutes on low flame. Serve with chapattis. Don't you think putting in onion paste, garlic and ginger paste, garam masala and methi, AND mustard oil, all in one simple vegetable dish is killing the semal flavour altogether? 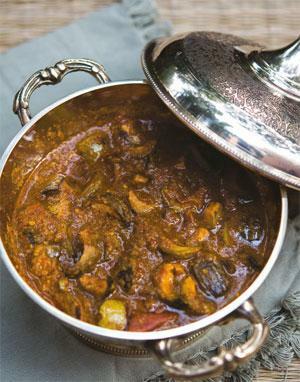 These impossibly heavy pungent flavors are killing the richness and delicateness of indian cooking.